This film was one of the more mainstream offerings in the array of films that emphasized the overly hyped Generation X phenomenon, a list that ranges from Slacker to Singles and includes a host of other films. Winona Ryder stars as Lelaina, a recent college graduate. Out on her own and independent from her supportive, but out-of-touch parents, Lelaina faces the realities of careers and relationships. She can't stand her internship under a local television personality (John Mahoney), and she's forced to choose between Michael (Ben Stiller), a well-intentioned music-video network executive, and Troy (Ethan Hawke), a brooding, sensitive slacker. Meanwhile, she must also protect the artistic integrity of Reality Bites, a video documentary that depicts the everyday lives of her friends (Hawke, Janeane Garofalo, and Steve Zahn). 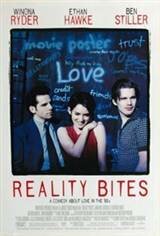 This 1994 release also marks the feature directorial debut of Ben Stiller.